American Backed Pakistani Military Dictator General Zia ul Haq (1977 - 1988) was powerful and sole power in Pakistan [like General Musharraf was from 1999 to 2008] in those days and the then Prime Minister of Pakistan late. Muhammad Khan Junejo (hand picked Prime Minister of General Zia's Martial Law Assembly 1985 - 1988) was just a Democratic Façade of General Zia’s ruthless Military Establishment, like the Democratic Façade of Prime Ministers Zafarullah Jamali, Chuadary Shujaat Hussain and Shaukat Aziz but the real power was with General Zia then and real power was with Musharraf from 1999 - 2008. 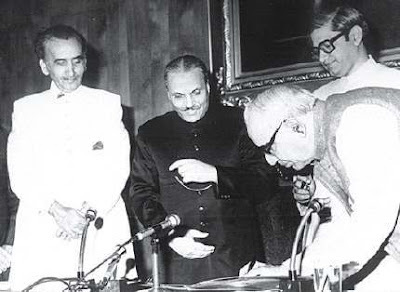 Keep in mind while going through the names of Junejo Cabinet under a Chief Martial Law Administrator General Zia [he was enjoying all power], Prime Minister and his several cabinet members were nothing but STOOGES. It was like PML - Q Government under General Zia who was enjoying complete and brute authority. READ AND ENJOY. OUR PRESENT Prime Minister Syed Yousaf Raza Gilani also served under General Zia's Martial Law and guess what the LOUDMOUTH PML-N LEADER Chaudhry Nisar Ali Khan was Petroleum and Natural Resources Minister in Semi Martial Law Regime of General Zia and Junejo. 1. Mr. Salim Saifullah Khan - Commerce, Petroleum & Natural Resources. 2. Prince Mohyuddin Baluch - Communications. 4. Sahabzada Yaqub Khan - Foreign Affairs. 6. 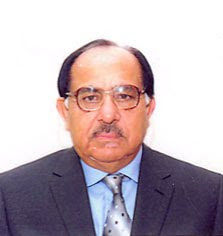 Mr. Zafar Ali Shah - Industries, Food, Agriculture & Cooperatives. 12. Nawabzada Abdul Ghafoor Khan Hoti - Railways. 1. Mr. Haji Tareen - Food, Agriculture & Cooperatives. 2. Mr. Zain Noorani - Foreign Affairs. 6. Mr. Maqbool Ahmed - Religious Affairs & Minorities Affairs. 9. Dr. Mohammad Asad Khan - Petroleum & Natural Resources. 1. Prince Mohyuddin Baluch - Commerce. 2. 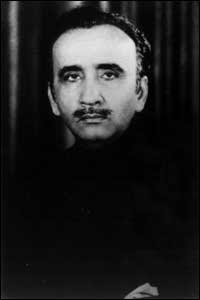 Malik Nur Hayat Khan Noon - Communications. 3. Mr. Ghulam Muhammad Ahmed Khan Maneka - Culture & Tourism. 8. Mr. Shah Muhammad Khuro - Health, Special Education and S. W.
10. Syed Zafar Ali Shah - Industries. 13. Mr. Iqbal Ahmed Khan - Justice and Parliamentary Affairs, Religious Affairs and M.A. 21. Syed Qasim Shah - States & Frontier Regions & Kashmir Affairs. 24. Mr. Wasim Sajjad - Justice & Parliamentary Affairs. 7. Kazi Abdul Majid Abid - Information & Broadcasting, Water & Power. 11. Chaudhry Nisar Ali Khan - Petroleum and Natural Resources.